CAMBRIDGE, UK, July 29, 2017 (ENS) – Illegal wire snare traps are creating a survival crisis for tigers and other wildlife across Asia. Today, on Global Tiger Day, the conservation groups TRAFFIC and WWF are urging the governments of tiger range countries to crack down on the practice. An estimated 3,900 tigers now survive in the wild. This recent revision from the 2010 estimate of 3,200 has come primarily from new surveys in India, Russia, Nepal, Bangladesh and Bhutan, according to WWF. The number is higher due to new areas being included in the national surveys, improved survey techniques as well as growth in the population from conservation efforts. This day was designated as Global Tiger Day at the 2010 Saint Petersburg Tiger Summit in Russia. The goal is to call attention to the severe decline of tigers in the wild. Listed as Endangered on the IUCN Red List of Threatened Species, tigers today inhabit less than six percent of their historic range, with a 42 percent decline since 2006. In 2006, scientists believed that breeding populations of tigers existed in all 13 tiger range countries: Bangladesh, Bhutan, Cambodia, China, India, Indonesia, Laos, Malaysia, Myanmar, Nepal, Russia, Thailand and Vietnam. But they now know that breeding tiger populations occur in just eight of those countries: Bangladesh, Bhutan, India, Indonesia, Malaysia, Nepal, Thailand and Russia. Although several sites in India and Nepal have reported recent recoveries, population reductions may not be reversible in other areas where tiger habitat itself has been lost, the IUCN says. And now tigers, elephants, leopards and other wildlife are facing the new danger of wire snare traps. The snares are easy to make from widely available materials such as bicycle cable wires, and they are quick to set up. 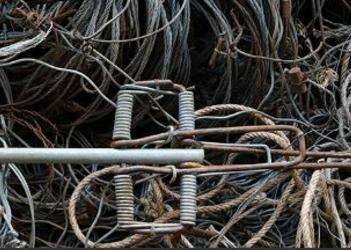 As a result, wire snares are deadly traps that are quickly becoming the plague of Asia’s forests. Driven by the growing illegal wildlife trade and demand for illegal wildlife products across Asia, more and more poachers are using snares to trap wild tigers, elephants, leopards and other wildlife. As snares can maim or kill any animal that activates them, wild tigers are dealt a double blow, as the prey animals they need to survive and reproduce are reduced also. “Snares are a commonly-used method of tiger poaching in Asia’s forests. They are especially dangerous because they kill at random – so all manner of wildlife is at risk. It is imperative that tiger range countries scale up their enforcement efforts to curb this crisis,” said TRAFFIC’s Global Communications Co-ordinator Richard Thomas. TRAFFIC is a strategic alliance of WWF and the IUCN. Within the Tropical Rainforest Heritage of Sumatra, Indonesia, a UNESCO World Heritage site and the only place on Earth where wild tigers, orangutans, elephants and rhinos are found in the same habitat, the number of snare traps are estimated to have doubled between 2006 and 2014. Many critical habitats lack adequate resources for protection. In nearby Rimbang Baling, one of several protected areas in Sumatra, only 26 rangers patrol over 1,400 square kilometres, an area equivalent to about half the size of the U.S. state of Rhode Island. “Removing these silent traps is not enough. Rangers on the ground must be supported by greater resources and strong legislation to take action against illegal poachers with snares,” said Singh with WWF. At the 2010 Saint Petersburg Summit, tiger range governments committed to the most ambitious conservation goal set for a single species – TX2, the global goal to double wild tigers by 2022, from 3,200 to 6,400 wild tigers. The Wildlife Conservation Society, WCS, based at New York’s Bronx Zoo, offers some encouraging facts today based on the society’s efforts in tiger range states. In Thailand’s Huai Kha Khaeng Wildlife Sanctuary, strong national government actions coupled with major investments by WCS, have reduced poaching and led to a steady increase in tiger numbers. In tiger landscapes of Sumatra, WCS staff have worked with local communities to build more than 400 tiger-proof corrals to reduce livestock losses to tiger depredation. This has reduced the number of tigers captured and relocated or removed from the wild due to human-tiger conflict from about 10 annually in 2006 to zero in 2016. Also in Indonesia, the collaboration between the national government and WCS’s Wildlife Crimes Unit has been responsible for investigations of 772 wildlife crimes since 2003, resulting in 442 prosecutions that included scores of tiger poachers, traders, and wildlife trafficking kingpins. Strong conservation measures in the Russian Far East by the government of Russia and conservation partners, including WCS, have enabled Siberian tiger numbers to increase to an estimated 500 animals from an all-time low of fewer than 50 in the early 1950s. 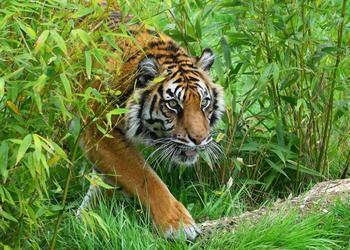 The government of China has committed to the creation of a 5,600 square mile reserve for tigers – an area 60 percent larger than Yellowstone National Park – for tigers in northeast China this year. A comprehensive plan and roll-out is expected by 2020. With technical support from WCS, the government of India has been supporting the voluntary resettlement of families who wish to move out of India’s tiger reserves. Since the early 1970s, tiger numbers have nearly quadrupled in the Western Ghats of India’s Karnataka State, with 350-400 tigers now roaming the region.